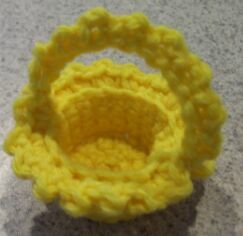 This miniature crochet basket is the perfect item to use as a special occasion favor. 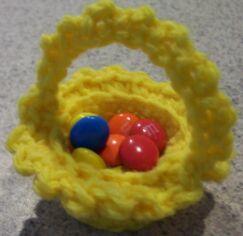 Just fill them with candy or nuts and add a name tag, You can even dress them up by adding a ribbon bow to the handle. Round 3 - Ch 1. Working in back loops only, sc in each st around. Join. Round 4 - Ch 1, sc in each st around. Join. Rounds 5 and 6 - Repeat Rounds 4 and 5. At end of last round, turn. Round 7 - Ch 1. Working in back loops only, [sc, dc, sc] in each st around. Join. Handle - Ch 18. On top edge of basket, directly across, attach with a sl st. * Ch 2, skip next ch, sl st in next ch. Repeat from * all along chain. Ch 2, sl st at base of starting ch-18.